LHASA - Tibet Airlines Co Ltd (TAC) took to the skies on Tuesday, as the highest region ofChina prepares to welcome more domestic and international visitors. The airline was certified to conduct commercial flights on the same day. The carrier's only aircraft, an Airbus A319 that was delivered on July 2, flew from Lhasa toNgari, a city in the west of the region. TAC plans to offer four services a day connecting Lhasa, Ngari and Chengdu, in Sichuanprovince. Each flight will take about two hours. TAC is based at the Lhasa Gonggar Airport, which at an elevation of 3,600 meters is one of theworld's highest civilian airports. 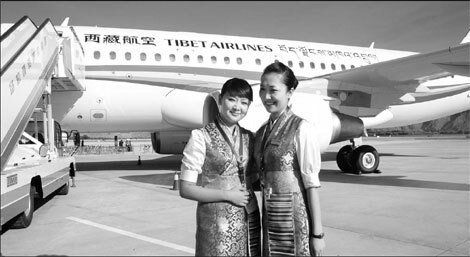 Cheng Hui, executive director of Tibet Airlines said TAC is seeking permission for non-stopLhasa-Beijing flights that it aims to launch by the end of the year. There are no direct services between the two cities at present, so the flying time is about sixhours, with a stopover in Chengdu or Chongqing. The non-stop flight will only take about fourhours, Chen said. "We should be the first choice for passengers to or from Lhasa," Chen told China Daily. TAC also hopes to expand into Europe. "Tibet is attractive to European travelers and we will have the ability to operate internationalroutes in three years," Chen said. Statistics from the China Tibet Tourism Bureau show that 6,400 foreign visitors came to Tibet inthe first quarter. The region had 228,000 visitors in 2010. However, the 16 air routes now available to Tibet, including an international link between Lhasaand Katmandu, the capital of Nepal, cannot meet increasing foreign demand for seats. Liu Yanping, general manager of Tibet Airlines, said the carrier also wants to have direct routesto Europe within four or five years. The airline plans to have about 20 aircraft by 2015 and routes serving key cities around thenation in the next year, said Liu. Flights to South Asia and Southeast Asia are expected by2013. TAC ordered three A319s, and the other two are scheduled for delivery in Lhasa in August andSeptember. Tibet Airlines' A319s accommodate 128 passengers in a two-class configuration, with eightseats in premium and 120 in economy class. Flying above the roof of the world requires more powerful engines, and Airbus modified itsengines to TAC's specifications, said Thorsten Eckhoff, who works at Airbus in customersupport. The systems on the A319s were also modified to supply oxygen for 55 minutes, compared withthe usual time of 22 minutes for aircraft that don't serve the plateau region, Tao Wenge, pressand information director of Airbus China Ltd, said. Airbus set up a customer service office in Lhasa in June to offer on-the-spot technicalassistance, he added.